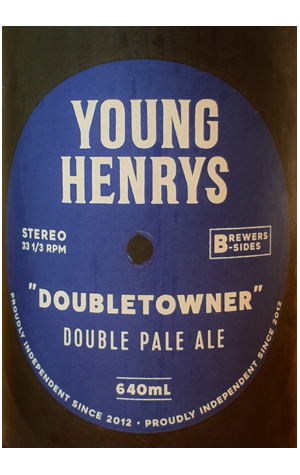 Of all Young Henrys’ beers, Newtowner is not only the most popular, but it’s the one that’s developed an identity all of its own. It’s entered the bloodstream of Newtown: you'll find it in the dark corners of live music venues, on tap in the old pubs, and in the six-packs people carry home to their terraced apartments. But, of course, it hasn’t just stayed in Newtown. Though it was originally brewed in the suburb that accepts everyone, it’s now spread across the country. So, when the Young Henrys brewers were deciding what to brew to celebrate their seventh birthday, they thought: “What if we take the Newtowner recipe… and double it?” Double the malt. Double the hops. Double pale ale. The malt provides a powerful bass line, thumping its sweet beat through the rhythm of the hops. The bitterness is there, but it’s just the backing vocals supporting the berry, the soft floral aromas, the spice and the grapefruit zest. A subtle boozy warmth keeps ringing in your ears after the last chord’s been played. Drinking Newtowner is like listening to your favourite song on repeat. Drinking Doubletowner is like cranking that same song up until your mum yells at you to turn it down.